Two Chicago Cubs fans kiss in a field at Taltree Arboretum for their engagement photos. 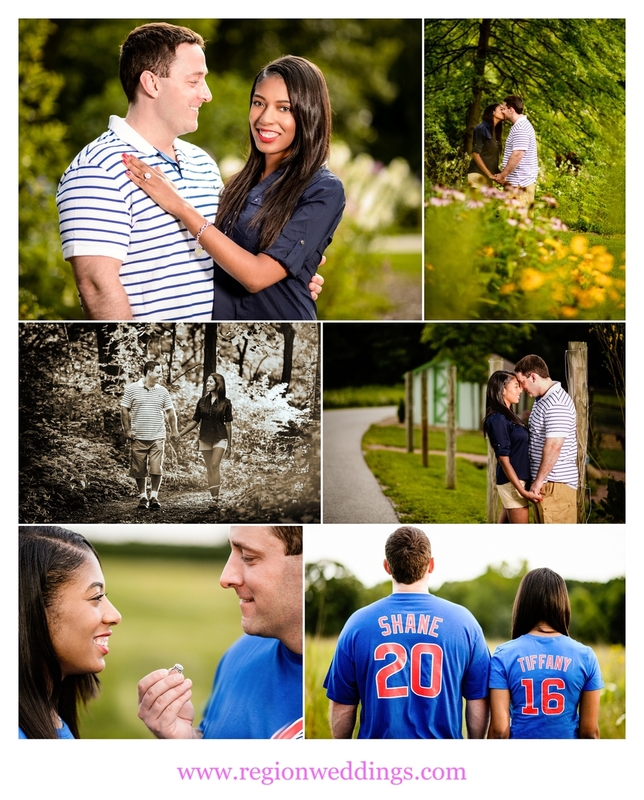 Shane and Tiffany's big request for their engagement photos at Taltree Arboretum was to show off their jerseys for their beloved Chicago Cubs. No problem!! We started off the engagement session with this cute couple strolling around the beautiful nature park with it's many colorful flowers and picturesque lake. A cute couple takes a stroll besides the lake at Taltree Arboretum with a big ball of sun in the sky. We photographed in the nearby woods as well as the garden area before Tiffany and Shane displayed their Cubs fandom and promoted their upcoming 2016 wedding. Tiffany's ring looked spectacular and we definitely needed to show that off for a few shots. Cute engagement photos at Taltree Arboretum in Valparaiso, Indiana. Engagement photo at the nature retreat of Taltree Arboretum. Chicago Cubs themed engagement photo.